Dylan McDonagh [3(1)-0] has taken on a short-notice fight with one of Matchroom’s hottest prospects. 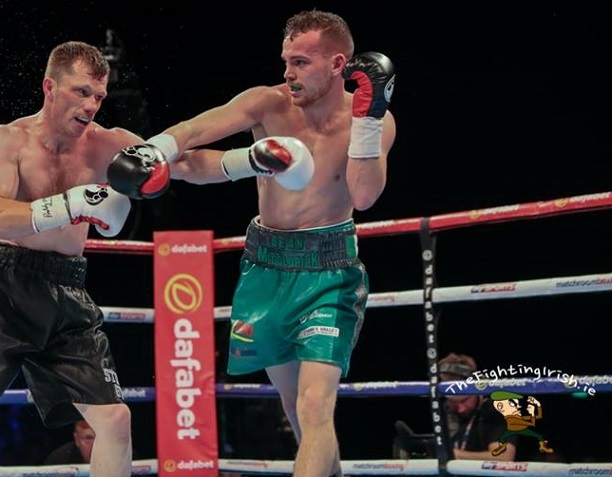 Irish-Boxing.com can confirm that the Jobstown bantamweight will take on Welsh whizz Sean McGoldrick [6(2)-0] this Saturday night [August 4th] in Cardiff. The pair will both step up to eight rounds for the fight which will be one of the main fights on the JD NXTGEN card at the Ice Arena Wales at the weekend. A Commonwealth gold and bronze medalist, McGoldrick turned pro with Eddie Hearn’s outfit last year and has racked up six straight wins, most recently outpointing former BBBoC Central Area super fly champ Craig Derbyshire. Born in Newport to a Donegal father and a Tipperary mother, McGoldrick has impressed thus far but looks set for his toughest test so far on Saturday against the in-form McDonagh. While it is a step up for McGoldrick, it is an even larger step-up for McDonagh and the Tallaght fighter will be a huge outsider for the Sky Sports-broadcast bout. 33-year-old McDonagh, seven years McGoldrick’s senior, last month scored a hard-fought win over tough Bulgarian Georgi Georgiev in what was his first six-rounder. While he was keen to fight next for a BUI Celtic title [which this match-up does fit the criteria for], the super-fit McDonagh has elected to jump into a high-profile, nothing-to-lose clash with McGoldrick. The Boxing Ireland fighter, trained by Frank Stacey at Westside BC, is the latest puncher from these shores to take on a Matchroom prospect following Craig O’Brien last week versus Anthony Fowler, Carl McDonald v Jordan Gill, and Jay Byrne versus Felix Cash, Josh Kelly, and Fowler. The card this weekend is topped by a vacant Commonwealth lightweight title fight between Olympian Joe Cordina and former champ Sean Dodd and also features Daniyar Yeleussinov, Gill, Gamal Yafai, Scott Cardle Akeem Ennis Brown, Daniel Barton, Kody Davies, Nathan Thorley, and Katie Taylor rival Natasha Jonas.